Co-commissioned by Trondheim Electronic Arts Centre for Meta.Morf 2016 – Nice to be in orbit! Starring: SARAH JANE PELL. Camera: SHAUN WILSON. Editor: JACQUI HOCKING. Visual Effects Artist: CHRIS BRAIBANT. Score: STEPHEN BISHOP and ROBIN HAYWOOD recorded live at Liquid Architecture Perth 2015, presented by TURA MUSIC and LIQUID ARCHITECTURE as part of the National Experimental Arts Forum hosted by SYMBIOTICA. Sound design: ALISTER MORLEY. Images NASA. Filmed on location at the Victorian Space Science Education Centre, VSSEC Mars Simulation. Production assistants: SEAN ELLIOTT, DANIELLE WILDE. 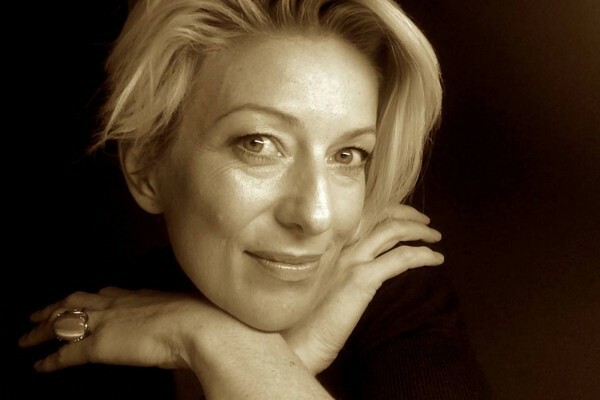 Writer/Director/Producer Dr. Sarah Jane Pell, RMIT University. Amulet grew up in a refurbished Russian satellite in Low Earth Orbit (LEO). From birth, she was supported by Liquid Oxygen and centrifuged daily to redistribute fluids to encourage growth and build bone density. 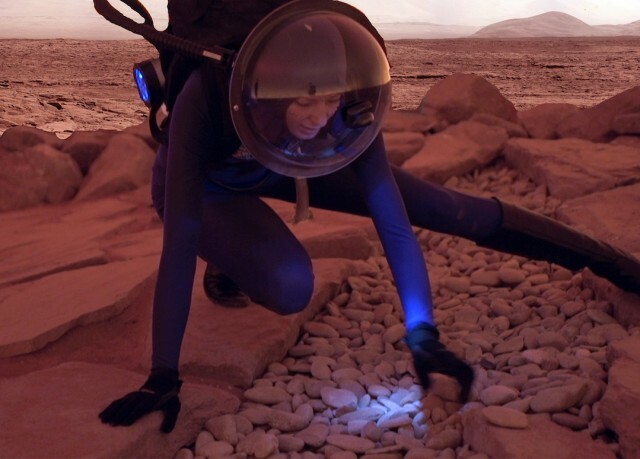 Not for the purpose of visiting Earth’s gravity –that would certainly kill her – but for the long duration space mission to Mars. “We are all Explorer Fish” begins with Amulet inside Laputa: the Mars lander hovering over the moon Phobos in aerosynchronous orbit with the planet below. We see high ice clouds and gigantic dust storms as we approach the red rocky outpost. Amulet wears vibrio-facial gas-analyzers designed to detect environmental and bodily changes. 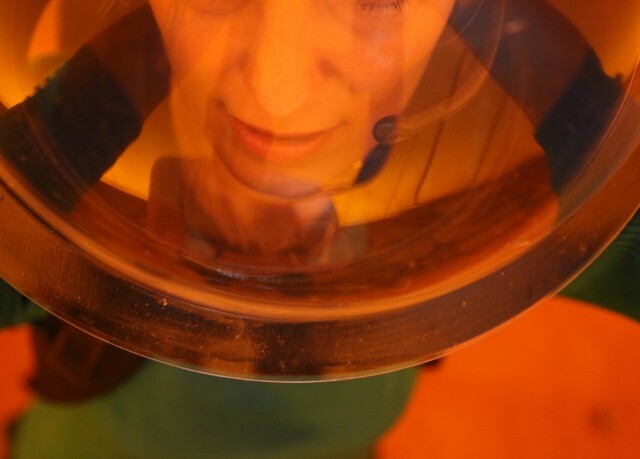 During the descent, she dons on her protective helmet to withstand the extreme temperature fluctuations .The hatch is opened during the warm air of the short Sol twilight: a fleeting opportunity of 12 minutes, 40 seconds between the extreme heat of the day (+35 degree C), and the freezing humidity of the night (-143 degree C). The landing site known as Windjana is within a science waypoint site called “The Kimberley,” where sandstone layers with different degrees of resistance to wind erosion are exposed close together. The site is named after The Kimberly in Australia where ancestral law tells of Wandjina creation spirits that reside in country. Their cosmogonies have been depicted in paintings on caves for over four millennia – the longest painting series in human history. As scientists and elders alike predicted, at night, when the Martian planet achieves 100% humidity, significant amounts of water vapor deposited in the core-sample holes left by the Mars Rover Curiosity in The Kimberley region on 2015. It is there that Amulet draws breathe from the sink wells through a filtered snorkel in an ancient riverbed. An instantaneous rush of pure Oxygen floods her body: a temporary “high”, before heavier toxic Carbon Dioxide floods her lungs. 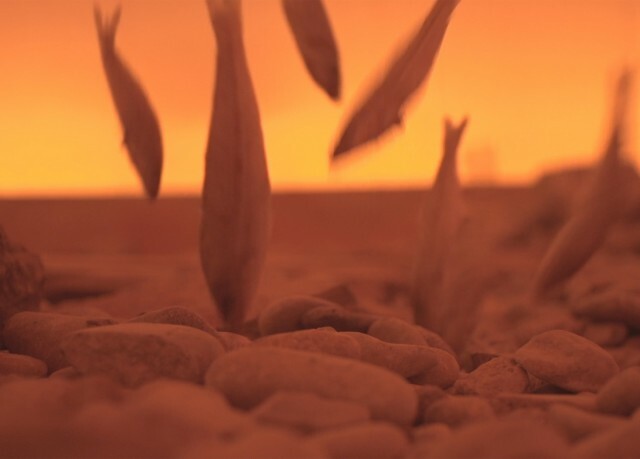 As the risk of ingesting indigenous Martian organisms becomes higher, and the cloud of hot rain within the impact crater starts to fall like a sky descending into a sea, she sees the ancient explorer fish come to life. Threatening her existence and the entire mission, she calls on her alter ego for help. “Amulet” is played by Sarah Jane Pell. Camera: Shaun Wilson. Production assistants: Sean Elliot, Danielle Wilde. Editor: Jacquie Hocking. Sound design: Alister Morley. Musical Score: Stephen Bishop and Robin Hayward recorded live at Liquid Architecture Perth 2015, presented by Tura and Liquid Architecture as part of the National Experimental Arts Forum hosted by SymbioticA. Images NASA. 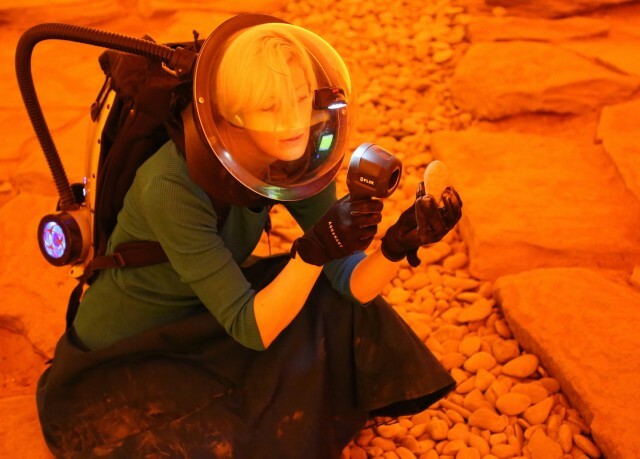 Filmed on location at the Victorian Space Science Education Centre, Mars Simulation. Writer/Director/Producer Dr. Sarah Jane Pell, RMIT University. 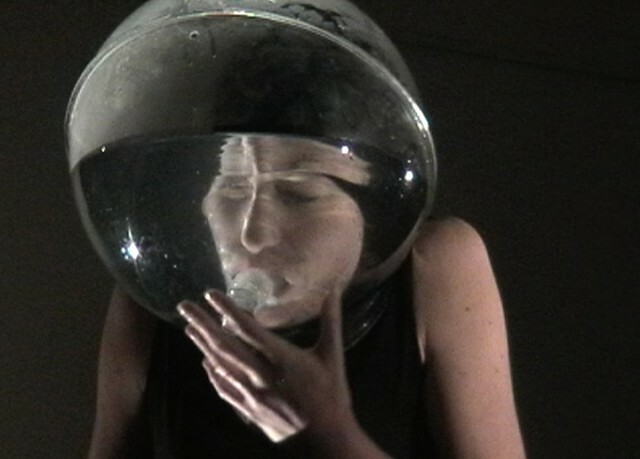 Australian-based performance artist who incorporates themes of human-aquatic adaptation to other worlds and other extreme-performance interfaces in her work. Dr. Sarah Jane Pell joins Scientist-Astronaut Class 1601 to conduct Polar Suborbital Science in the Upper Mesosphere (PoSSUM) for the NASA Flight Opportunities Program Experiment 46-S, Noctilucent Cloud Imagery and Tomography Experiment (ETA 2017). 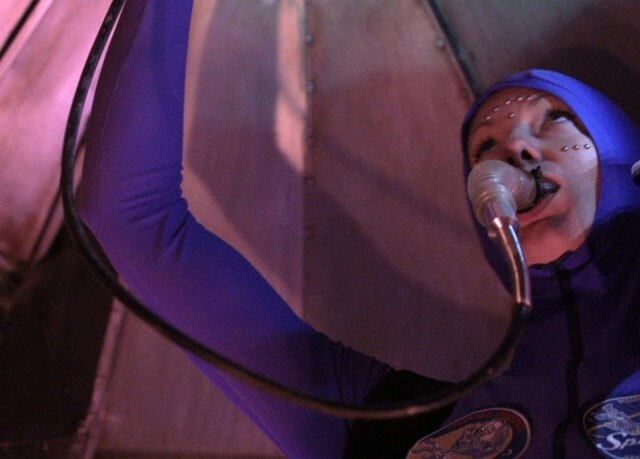 Space analogue and arts experience includes Artist-Aquanaut, The League of New Worlds, Atlantica Expeditions subsea habitat mission, and a self-devised expedition “Bending Horizons” to make art on route to the Mt. Everest Summit. (Reached Everest Base Camp 5364m. Survived Nepal earthquakes 2015). 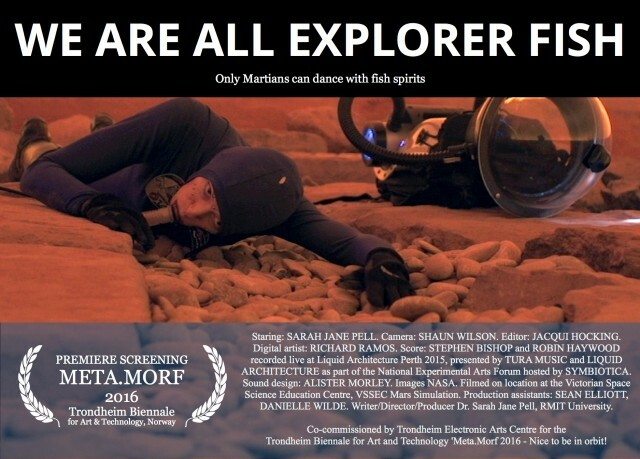 Formerly Co-Chair, European Space Agency Topical Team Art Science [ETTAS] 2011-2014, and Principal of the Aquabatics Research Team initiative [ARTi] Pell developed underwater live art and “aquabatics” research 2002-2012, and logged over 5000 hours as an ADAS P2r Commercial Diver. 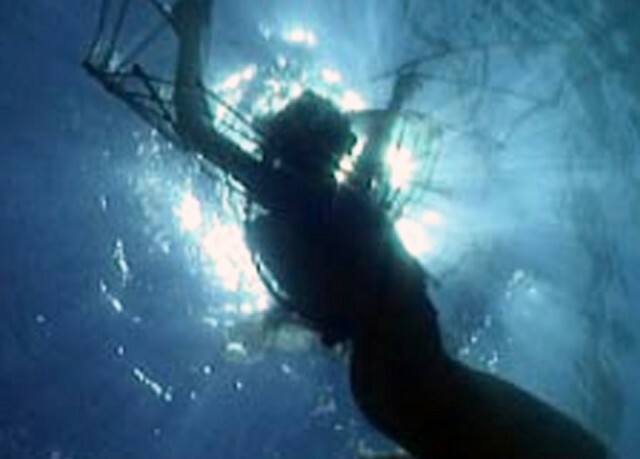 Underwater performances include “Second Nature: Second Skin”, “Hydrophilia”, “Petrification”, “Trans.Port” and pneumatic acts “Under Current”, “Interdepend” and “Odyssey”. Artwork in space includes “Moonbounce” (Opticks) Radio signal performance between Earth-Moon 2013 (IT/NL) and Micro-etching space art (SPRITE-SAT) Payload H-IIA JAXA GOSAT launched in 2009 (JP). Dr. Pell is an RMIT University Research Fellow (AU) and TED Fellow (US). She is reimagining extreme performance and new worlds.